EDIT: 11.12.17 - I have not updated the build to patch 3.1 and Abyss League. If you follow the guide you are responsible yourself to do the necessary changes, there is some info on page 9 to get you started. the powerful Ascendancy nodes of The Gladiator that gives 100% of Block Chance Applies to Spells. The result is a build with high survivability, damage, and move-speed. Most melee attacks skills can be adapted to fit with the build, what gear and gems I use is just personal preference. Questions and feedback are welcome. For a budget variant of the build I would go for Belly of The Beast and Lycosidae, then you don't have to care about accuracy on gear and Belly's life will balance the life loss u get from using Lyco / Abyssus. A 300+ pdps sword with crit, and life and resists on the rest of the gear should do it. 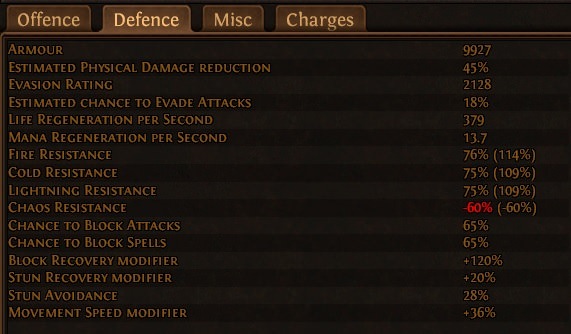 Abyssus is a good option if you feel the damage is low, if you can get above 8k ingame tooltip damage with herald and Hatred up it should be enough, but still, the more damage, the better. Oh, and attack speed is vital on jewels, this build thrives on a lot of attack speed. Here is a suggestion for a level 90 skill tree with the items mentioned above. Just copy paste the entire PoB code into "To import a build, enter the code here:"
edit: Optimized skill tree and gem setup, added new screenshots. What points? Aegis is interesting for an added layer of defense, I don't have the currency or gear atm to play with it. Feel free to propose what changes will have to be done to the tree and gear for Aegis to shine. I just leveled to 90 and I see now this is a build that really starts to work well after lvl 90. I also see now it is possible to cap blocks at 75% without using Rumi's flask and without having to go back on the damage nodes. This is surely interesting indeed. Testing out this combo now, with good pack density the gem fills up on every use, alot thanx to the Gratitious Violence node that gives bleed chance, increased damamge against bleeding enemies and corpse explosion dealing 10% of enemies maximum life as physical damage. Gonna try this out. Loong time max block cybils player. 1: In what way would u go max block without the flask? lets make use of the +8 so no overcap. 6: How important is Mana flows, build enabling? Build looks pretty solid. How much cyclone dps do you get with a 5-link? 4-link? And what gems would you sacrifice if you don't have a 6-link? 1. With the lvl 90 tree I updated in the first post, 4% block from jewels, 3% from tempest shield and 30% from Lioneye's shield we will end up on 75%. That is included the 8% 3'ish seconds block buff we get from the Painforged Gladiator node. 2. 44% phys reduction is a bit low, with high armor on all gear pieces we will make it up to around 50%, the rest we have to get from popping armor flask in tough spots where it is needed. An option is also to change some damage nodes with armor nodes. 3. I prioritize Cyclone - Melee Phys - Added Fire - PcoC - Incr. Crit - Weapon ele dmg. Make your own setup according to attack skillgem that you choose, but know that to get crit chance to around 90% both Incr. crit Strikes and PCOC mus be linked. 4. We use whirling Blades for fast travel. 5. I use +block jewels now, they are a must if you want to cap the block wo using Rumi's. 6. I ran into problems sustaining mana when leveling, it depends on the mana cost of the skill you choose to use, it is purely optional and one has to test it. With mana regen on gear it may be obsolete, just know that. As you can see on my gear I have a hybrid mana flask that I use, with single targets we can run out of mana. Just test what feels good, with the current setup I have posted it works very well for me. We can also pop in a blood magic gem if needed. Another point is the weapon, we want a sword with at least 8% critical strike chance, with a Vaal rapier being the best in slot as far as I know. Any crit chance lower than 8% will affect our overall chance to crit a lot. Accuracy on gear is also needed. At level 90 with the setup I have in the first post i have 86k tooltip dps. 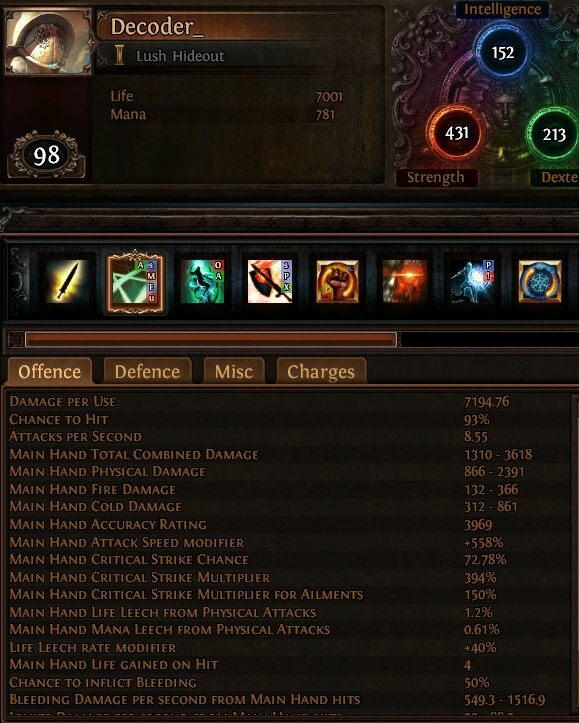 If I take out Weapon ele dmg gem I have 66k dps. This is with 4 power charges and 3 frenzy charges active. Taking out Added Fire I get 46k dps. An option is to change Wpn Ele Dmg with Incr. Area of Effect for better clear speed and range, the damage would still be ok. The gems I'd sacrifice I mentioned in the post above. Note that if we want to use IAOE we need 3 blues sockets in our chest, that can be difficult on an armor base. Added a video of running a physical reflect with vulnerability Overgrown Ruin map. oh, and what will this baby do when having the Gratuitous Violence node? Should test with the Bloodlust gem.